Many Windows error messages are fairly descriptive about the problem that occurred, while others are very cryptic. 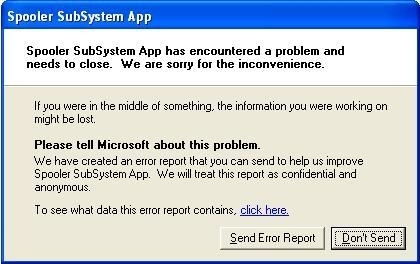 If you are working with Windows and you have seen the “Spooler SubSystem App has encountered a problem and needs to close” error, you have run into one of the more cryptic variety. In simple terms, the spooler subsystem app queues up the data to be sent to the printer in small chunks that it can handle without getting overwhelmed. If a third-party application interferes with this system, or it stops suddenly, you may encounter the above error message. There are a few ways to attempt to fix the problem. The Microsoft Fix It software is designed to diagnose and fix a number of problems related to Windows, printers, and other hardware. In many cases, it may be able to resolve the spooler subsystem error. Simply install the program and follow the onscreen prompts to attempt to repair the problem. In some cases, the spooler service may have stopped, and simply needs to be restarted. Click the Start button and choose Run. Scroll down to “Print Spooler”. Right-click it and choose “Restart”. Right-click “Print Spooler” once more and choose “Properties”. In the dropdown box, select “Automatic”, then click “OK” to save the changes. If the error message still persists, the spooler service may be affected by your printer’s drivers or software. See our page on Installing a Printer Driver for instructions for reinstalling the driver and software. In most cases, you should download the latest drivers and software from the manufacturer’s website, as the problems you are experiencing may have been addressed in a recent update. By trying the solutions above, you will have hopefully resolved the error message and you can resume normal printing. If you are still experiencing issues, you may want to contact technical support for your printer manufacturer for more specific troubleshooting.